On 5 November 2013, the Centre was pleased to welcome journalist and writer, Jackie Kemp, who discussed ‘1979: Scotland’s First Constitutional Referendum’. Below is this listener’s brief summary of the lecture. Jackie began her lecture by quoting the Danish philosopher Søren Kierkegaard: “Life must be lived forward, but can only be understood backwards”. Living as we are in the shadow of the upcoming 2014 referendum, obtaining knowledge of past constitutional experiences in Scotland may well be enlightening. The 1979 referendum for devolution of a Scottish parliament was a watershed moment in post-war British history. Many important concepts were in flux, such as social justice, gender relations, the NHS, worker’s rights, and the class system; the referendum was a cusp moment for many of these ideas. Jackie drew on her father’s work and legacy for much of the discussion. The well-respected Arnold Kemp was Herald editor for fourteen years, and commentated on much of the 1979 campaign. (Read more about Arnold here) One day after the referendum, March 2 1979, many of the Yes campaigners were found in a local watering hole mourning their marginal defeat. Many felt there was no future for a devolved Scottish parliament. However, Arnold strode in, ordered champagne, and declared ‘We won, right?’. 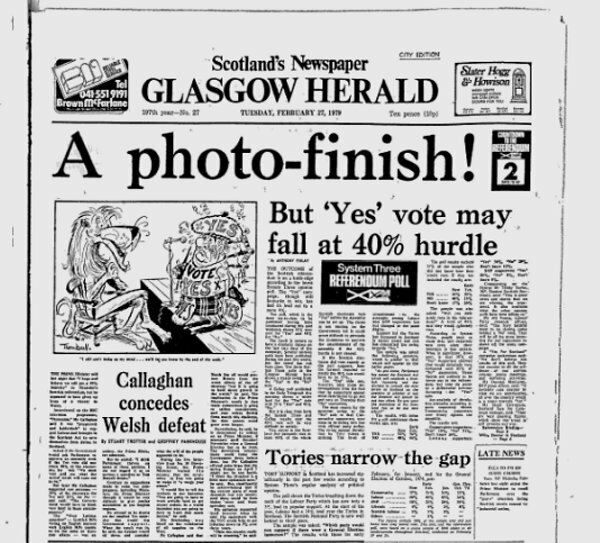 Media coverage by The Herald in the lead-up to the referendum. In the lead-up to the referendum, there was widespread support for Home Rule. Between 1947 and 1950, the Scottish covenant, a petition calling for Home Rule, was signed by 2 million people, from a population of around 5 million. Despite this huge support, the petition was largely ignored by Westminster. There was public outcry at the coronation of Elizabeth II of England, who allegedly turned up in Scotland later wearing a dowdy rain-coat, while the Scottish nobles were dressed up in their finery. Considering this, it could be said the No campaign fought well by turning this opinion around. The main problem with the Yes campaign was a lack of coherence and unity. Many looked to Labour to lead from the front during the campaign, but there was widespread reluctance from within the party; disagreement ran rife over whether devolution was even a good idea! A similar lack of agreement was prevalent within the SNP, as some within the party felt devolution could dilute Scottish nationalism, and that the whole idea was a devious trick by Labour. Overall, there was a lack of dynamism and excitement during the short ’79 campaign. The results of the 1979 referendum. In the aftermath of the campaign, the British Conservatives promised to review the Scottish parliament to create a new, improved system. However, Westminster had little interest in following through on this promise. The subsequent years of Thatcher were an undeniably terrible time for Scotland, and perhaps the greatest casualty was the death of the skilled working-class. Teachers and doctors were not hit as hard, and some have attributed the low-life expectancy of the west-coat of Scotland to a sense of hopelessness (and worklessness), rather than poor physical health and diet. Following the successful ’97 campaign, the Scottish parliament was opened in May 1999. After a period of ‘sober and unpretentious’ celebration, it didn’t take long for the knives to come out. One Lib Dem MP, Donald Gorrie, denounced Labour as ‘the biggest bunch of liars you could ever meet’. However, after this difficult teething period, Holyrood has emerged as a real source of pride for the Scottish people, it just remains to be seen if greater divergence from England will follow after September 2014. Our seminar series continues next week with the Centre‘s Inaugural Lecture by Professor Dauvit Broun. ‘Rethinking Scottish Origins’ will be held on 12 November at 5.30pm in the Humanities Lecture Theatre in the Main University building.